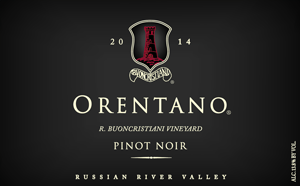 Our artisan Pinot Noir was handcrafted from our estate R. Buoncristiani Vineyard, in Russian River Valley. Made in a style that is very food friendly, this Pinot Noir is reminiscent of a New World Pinot Noir. The flavors of blueberries and ripe purple fruit come from early mornings of continuous fog, to warm afternoons of bright sunshine. With a touch of vanilla on the finish, this Pinot lingers on your palate just long to want another sip. We now offer 10% case discount on orders of 12 or more bottles! Wine was punched down twice a day and pressed off at dryness.